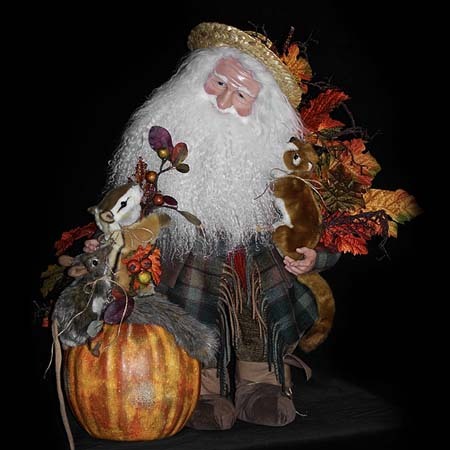 Fall Frolic Santa figure is a wonderful Seasonal Santa, perfect for Autumn. 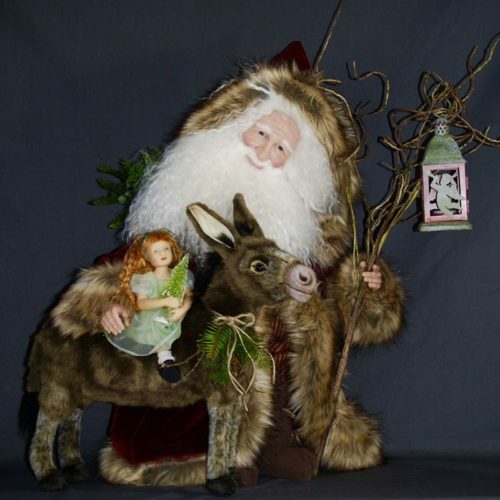 He is 26 inches tall and a handcrafted, one-of-a-kind Santa. His jovial face is hand sculpted with polymer clay. 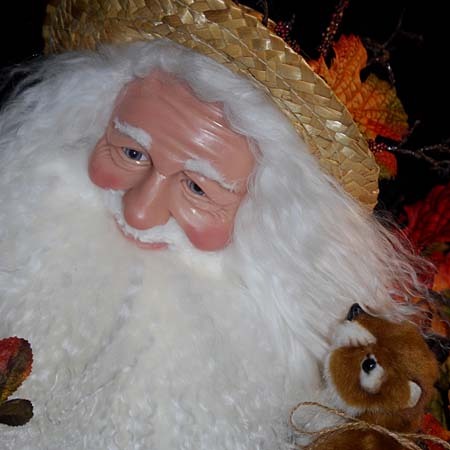 Fall Frolic Santa has a beautiful Tibetan wool beard and head of hair. Uniquely, he wears a lamb’s wool (woven in Edinburgh) vest with velvet pants and jacket. His boots and cummerbund are crafted with fine brown and golden pig suede. He is adorned with a garland of beautiful silk fall leaves and holds a handmade central park red squirrel. 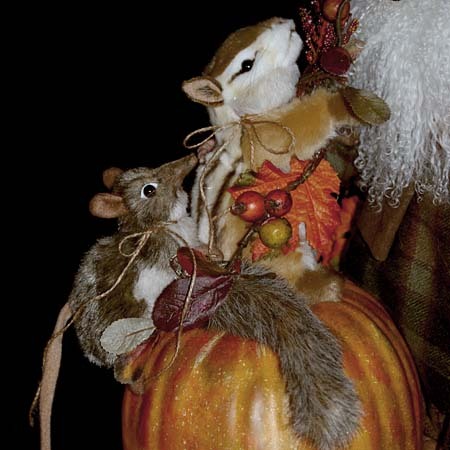 His right arm hugs a pair of additional handmade, realistic animals, sitting on an orange pumpkin. Fall Frolic stands free and needs no doll stand because his body is made with wood and steel. 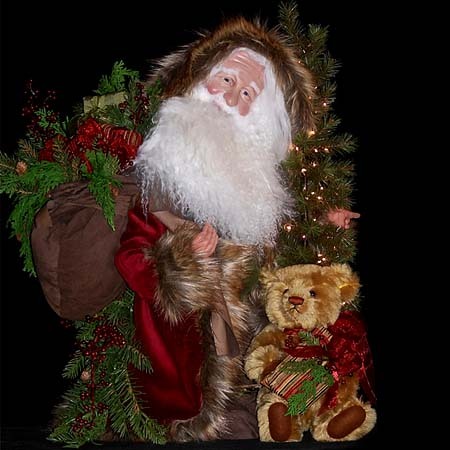 As are all Stone Soup Santas, this lifelike Santa Claus is a happy fellow, perfect for that Santa collector who likes to get a jump on the holiday season. 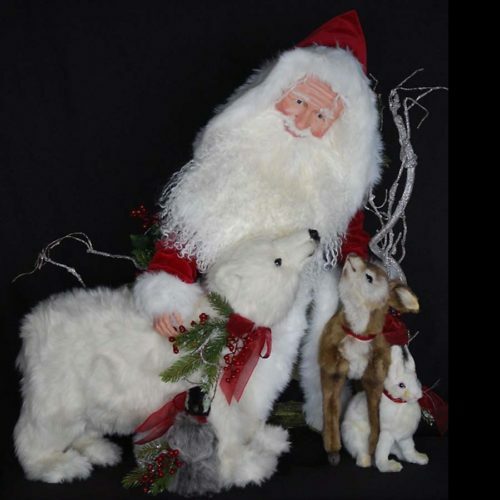 Fall Frolic Santa is a memorable addition to your Christmas collectibles.